Although I don't actually suffer with acne any more like many people I do suffer with occasional breakouts, usually related to 'that time of the month' or things like stress. 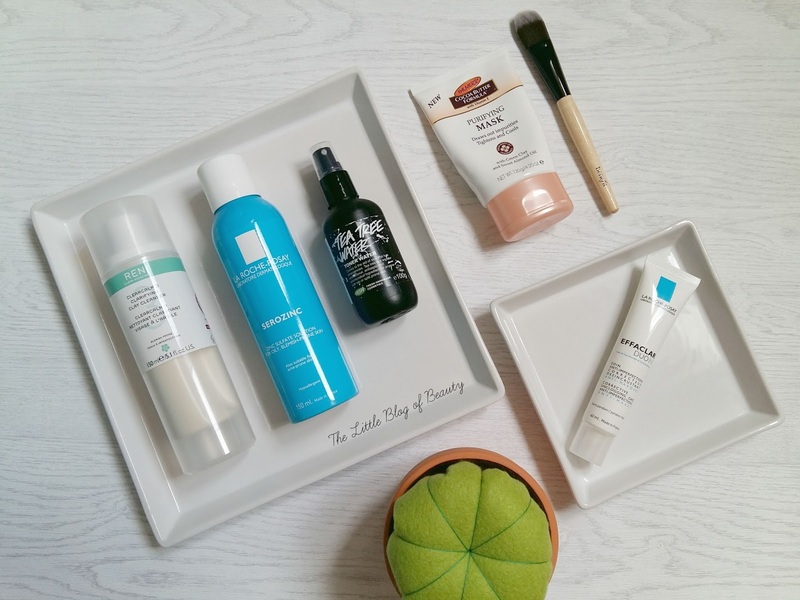 There are a few skincare products that I think really do help in trying to prevent these breakouts, or help to treat them when they do occur, so I thought I'd do a little roundup of my favourites. If I'm suffering with a breakout my first step will be to apply a clay mask to try and draw some of that yuckiness up and out of my skin. When I was much younger I tried my first clay mask and had to wash it off very quickly when my skin started to burn and I've avoided them ever since. It was only a few years ago when my boyfriend told me that clay is inert, so it's unlikely that it was the clay that I reacted to, that I decided to give them a try again. Now I'm always very cautious and make sure I do a patch test first on a small area of skin. My favourite clay mask is Palmers Cocoa butter formula Purifying mask. This comes in at under £5 so is a bit of a bargain, but I'm not entirely sure it's available any more. If it's not then my backup is the Good things Five minute facial face mask. I've included a foundation brush in the photo because this is my preferred method for applying a clay mask. It makes it less messy and a little more hygienic than using your fingers, especially if you give the brush at least a quick clean after every use. I know you could just wash your hands before applying, but I just prefer using a brush. You probably can't quite see but this is actually a Benefit brush, so possibly a little on the expensive side to be using for this purpose, but I won it and don't actually use flat foundation brushes so I found another use for it. A recent addition to my skincare stash is the REN Clearcalm 3 clarifying clay cleanser. I really wanted to try this but was a little unsure about taking the plunge and buying it because for one it's quite expensive at £19 and also because I thought it might not be the ideal product for dry skin. After reading a couple of reviews I thought it was safe to give it a try and when my boyfriend offered to treat me in Space NK I made it mine. It's safe to say I love it and I'll dedicate a full post to it soon. After using a mask/cleansing there are two toners that I find really help with preventing and helping to treat blemishes. These are Lush Tea tree water and La Roche-Posay Serozinc. There was a lot of excitement when it was announced that Serozinc was finally going to be available in the UK and I was invited along to an event to celebrate this, but unfortunately I couldn't make it. I was told they'd pop one in the post for me to try, but apparently demand was high and supply a little on the low side so I only received it around 5 months later! Using this on my chin seems to really help with preventing/treating blemishes. I'm coming towards the end of my second bottle of Tea tree toner water and I'll be repurchasing when it runs out. Tea tree is antibacterial, antiseptic and antimicrobial, so it's great for killing spot causing bacteria and stopping it spreading across your skin causing further blemishes. One product that I bought soon after its release and have used every day since is La Roche-Posay's Effaclar Duo+. This is a pretty amazing all rounder helping to prevent blemishes in the first place, helping to get rid of them more quickly when you do get a breakout and helping to heal the skin and reduce scarring afterwards. If my breakout does start to get bad enough I will end up turning to my prescription treatment, but this is usually good enough for mild to slightly more severe breakouts. I've found that this and the tea tree water are pretty amazing together. Do you suffer from blemish prone skin? What products do you like to use? I've just started using Serozinc, I'm not sure at the moment, it's hard to tell if it does anything but I use it most mornings. I love the Ren Clay Cleanser, it just feels so nice and soothing and has made such a difference to my oily skin. I like using exfoliating toners to help keep my pores clean, Paula's Choice Resist 2% BHA is very mild but works like a dream. I've just ordered Alpha H Liquid Gold which I hear good things about. I looove Effaclar Duo +! My brother ended up buying his own tube when he got a nasty cyst like spot on his face, it zapped it away! I'm desperate to get my hands on Serozinc, I've heard amazing things about it, especially for oily skin like mine!